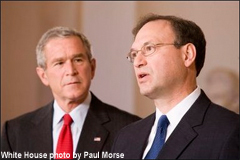 Judge Samuel Alito, the most recent nominee to the Supreme Court is another really strange choice. I wonder if The White House has been doing their homework. It has been reported that he refused to recuse himself from two cases in which he had personal, financial conflicts of interest. Does that really show just prudence? Is this really befitting of a Supreme Court Justice?